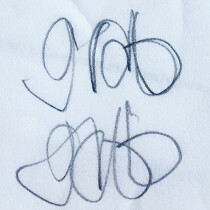 Collaboration between gab, Mapfiy and Katy Hawkins. We propose unearthing, visualising, and sharing a commoning network: of commonalities, common assets of places, people, interests and conflicts. A living, breathing, infinite network that is community-owned. The aim of our this new project is to bring people together to informally talk, consult, devise action and share knowledge. Encouraging local people to communicate common everyday social issues, that they bring forward, and to inspire possible solutions. As we encourage this process in the physical realm, we digitally visualise these previously invisible connections of content, local people and ‘hubs’. This information is then accessible to the wider community acting as a resource that can enable further action, behaviour, support and information between different social groups. 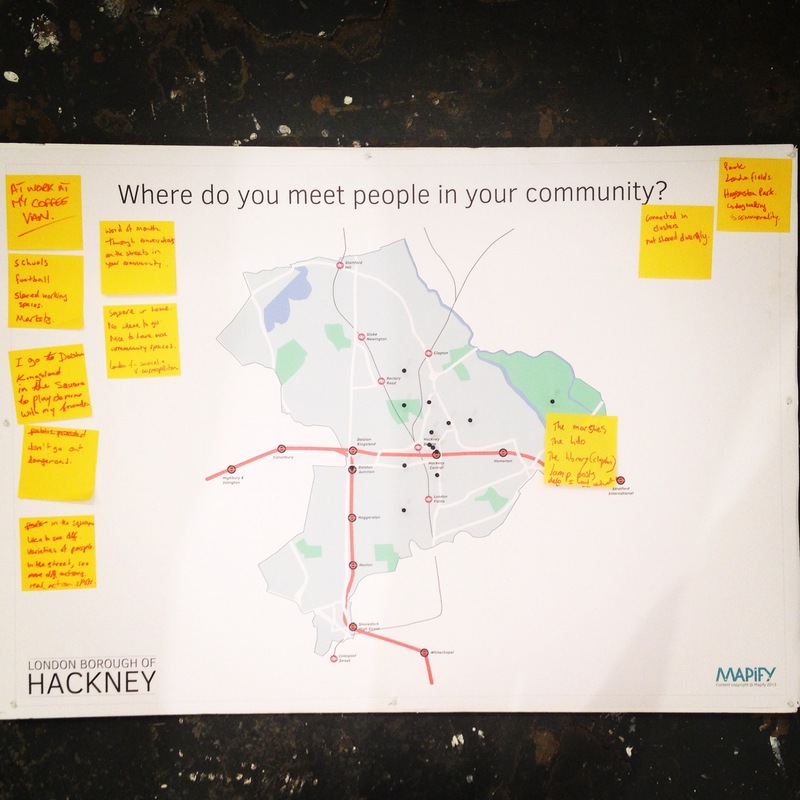 We are offering a programme of true community consultation as a model that has the potential to move into different social spaces across London and beyond. The venture is currently based in Lower Clapton, Hackney and Church Street, Westminster, where we are exploring differing ideas around community and placemaking, looking particularly at issues surrounding redevelopment. These projects have sought to identify local hubs (from launderettes to pubs or local cafes) and determine, measure and map the social value that these social hubs generate. By visualising the networks that are nurtured and grown within these hubs, we not only map networks of people but we demonstrate the social value certain local spaces generate. This information has so far been used to map local assets, building a social-viability report on an area that can direct innovative future placemaking and help local people reclaim local spaces. The project seeks to engage with a wide variety of people from differing socioeconomic backgrounds that are linked by their geographical position of working or living in the project catchment area, and connections of commonalities. When directing local change or seeking to make improvements to an area on both a social and physical level; future placemaking must learn how to be innovative, accessible and flexible by connecting various groups. Future placemaking must learn how to successfully and simultaneously adapt and preserve common spaces. Our proposal seeks to demonstrate a new process of community consultation and a means to which communities can generate local social capital, and build resilience and capacity in their own right. If people understand how to build successful networks of exchange then we can begin to build new local economies that are based on the exchange of creativity, knowledge, understanding and support. We need to learn how to translate our ability to build large networks of people online into action offline, so that local networks can mobilise each other to work toward overcoming local issues, demonstrating to individuals the common benefits that being part of a community network of diverse groups can bring. With diminishing resources and an uncertain global economy we are already seeing how these global scale issues affect our local communities, the future must focus on capacity building at a local level. if we can learn to successfully grow, shape and reshape networks of support and resilience we can redesign ‘architectures of perception’ and changing our ideas of what is possible. Therefore Connections In Common is a resource itself. A place for individuals and groups to share and receive information. This project ultimately aims to help communities reclaim their area, in a physical and social sense. Individuals from all corners of a community will benefit from being encouraged to pinpoint, reclaim and share social spaces – where they can be in the company of their neighbours to share and discover commonalities. The information, connections, and ideas shared in these spaces will be digitised – making it visible and accessible to all; from individuals to local authorities and service providers. Mapping, measuring and quantifying the social value of local space, whilst discovering alternative functions for existing local spaces. This project hopes to instigate social bonds, building bridges of exchange to move information, knowledge and support between the groups. This will reduce levels of conflict by challenging misconceptions and disparities by providing opportunities for myths to be dispelled between the different community groups, breaking down barriers between different demographics and building a strong sense of community, neighbourliness.The users will build confidence in expression, strengthen voices and raise aspirations. The project will provide information of existing services available, responding to those involved needs and provide information to support them in accessing their entitlements.